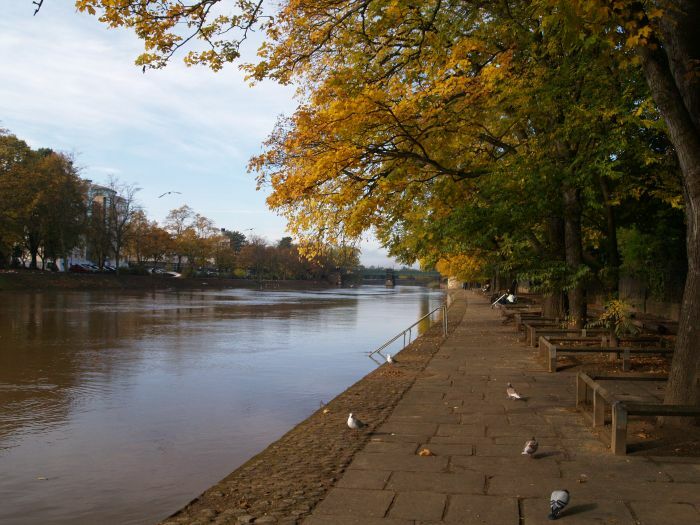 A hint of Autumn colour on the banks of the River Ouse at York. 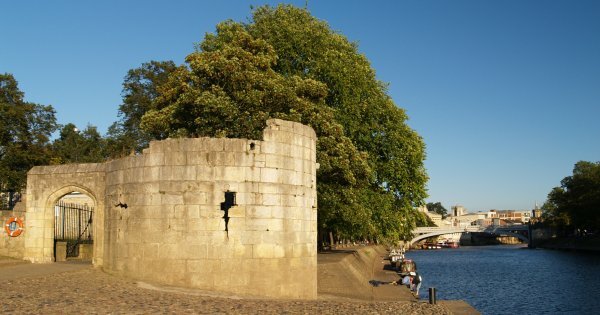 A ruined round tower (of St Mary's Abbey walls) on the north-east bank of the River Ouse, looking south-east down river towards Lendal Bridge. 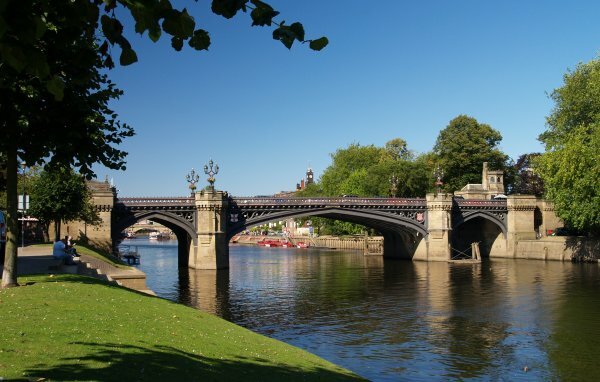 The current Lendal Bridge was built in 1861-1863 to the design of Thomas Page and is the most northerly of the three main bridges which cross the River Ouse. It is made of iron with Gothic details. 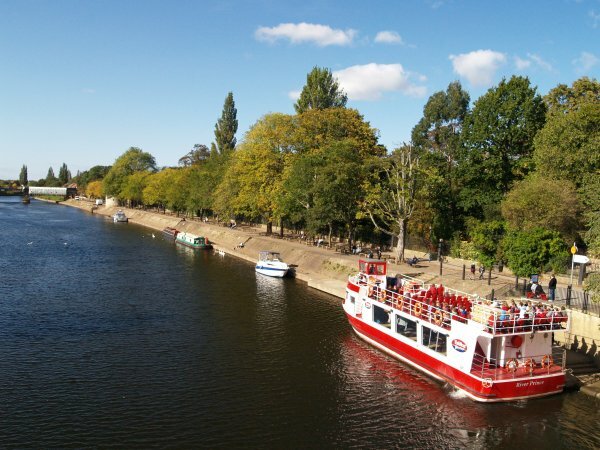 Plenty of inhabited barges on the river as well as the pleasure boats for a river tour, Lendal Bridge in the distance. 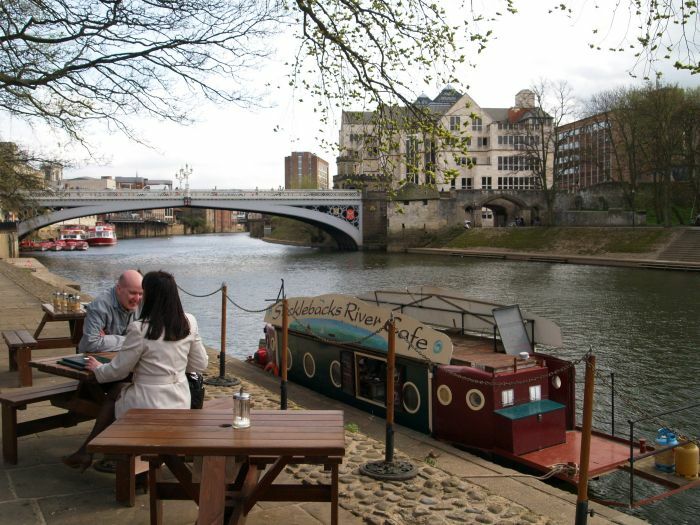 The Sticklebacks River Cafe on a barge! 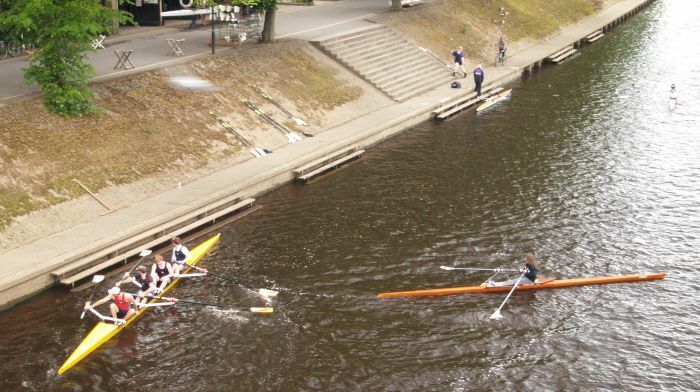 Tourist-pleasure cruise boat passing the Museum Gardens. 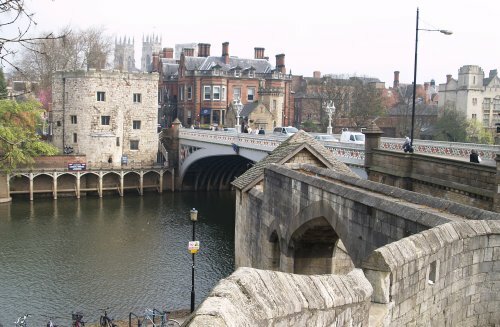 Lendal Bridge and the Barker Tower, the latter is also known as the North Street Postern Tower. The tower gets its name from the barkers who prepared oak in the tanners yard close by and has had many uses including a watch tower and is now a craft centre. 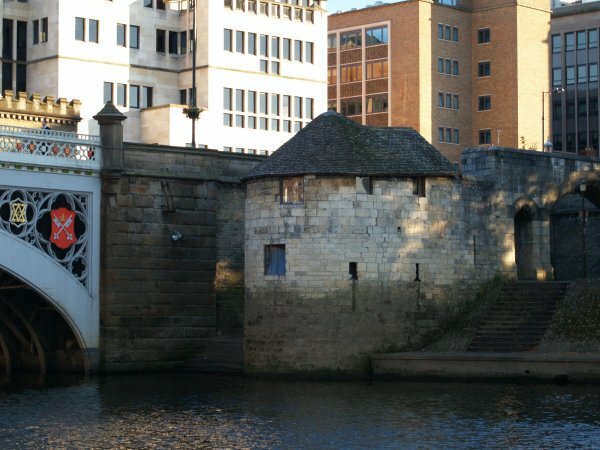 A chain was hung across the river from Barker Tower to Lendal Tower to prevent trading ships from delivering goods to the city without paying tolls. 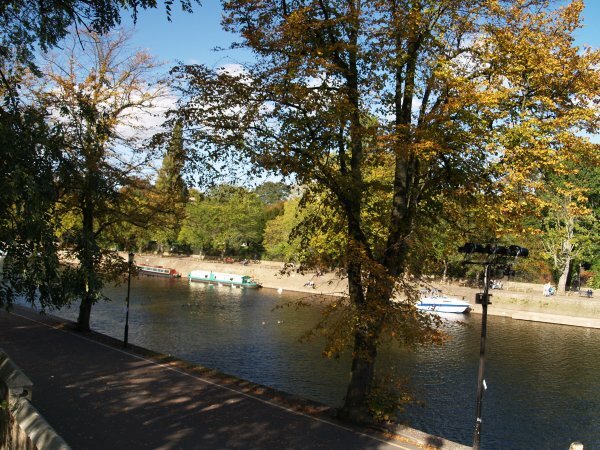 In the 19th century, ferrymen leased the building to operate a ferry service across the river and it has also been used as a mortuary to temporarily store bodies pulled from the river! 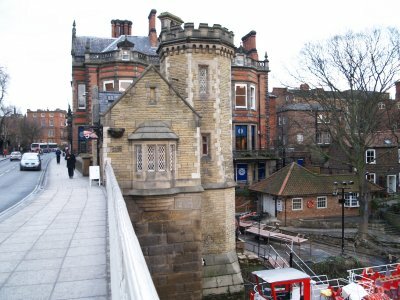 The Lendal Tower (left) by Lendal Bridge, dates from about 1300 and was part of York City's defences. 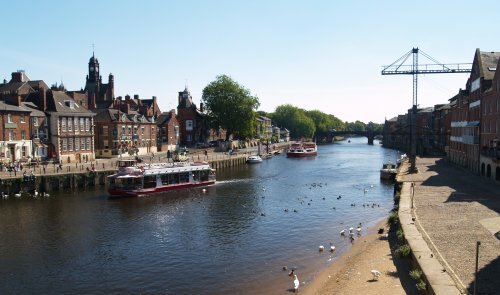 During the 18th century it housed the steam powered pump that supplied water to York which continued until the mid-19th century. 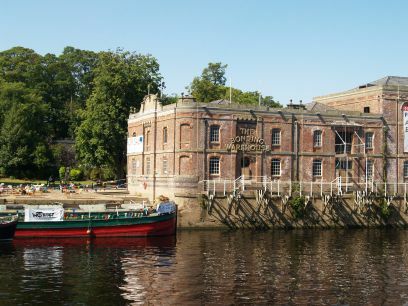 It was refurbished in 1932 and now houses the York Waterworks Plc Company's boardroom. Part of City's defensive wall system are in the foreground. 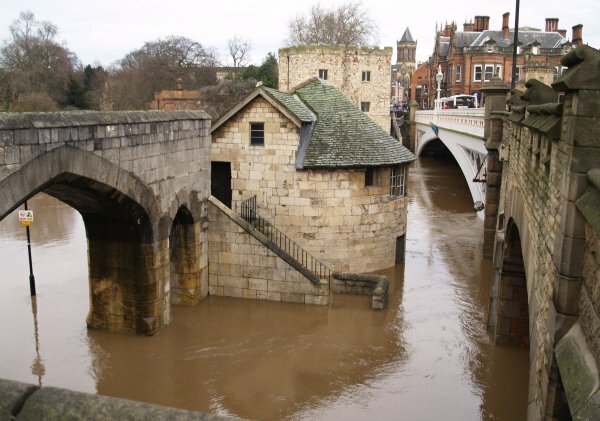 The Barker Tower with the River Ouse in flood. 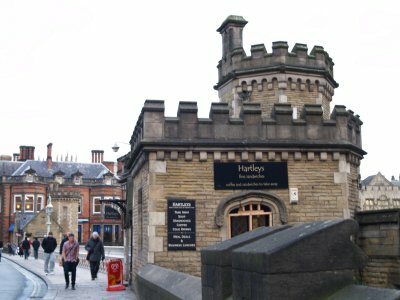 There are small cafe's eg Hartleys, at each of the Lendal Bridge built in a sort of Victorian Gothic revival style. 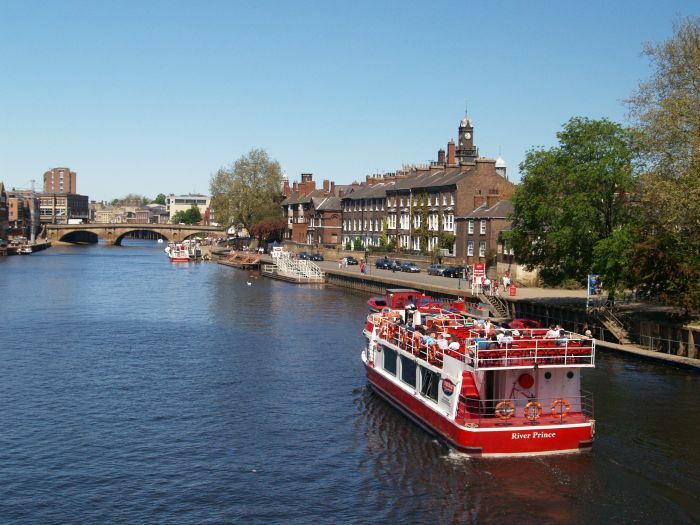 View from the Lendal Bridge to the Ouse Bridge and the cruise ship and pleasure boats for hire moored by the Guildhall. 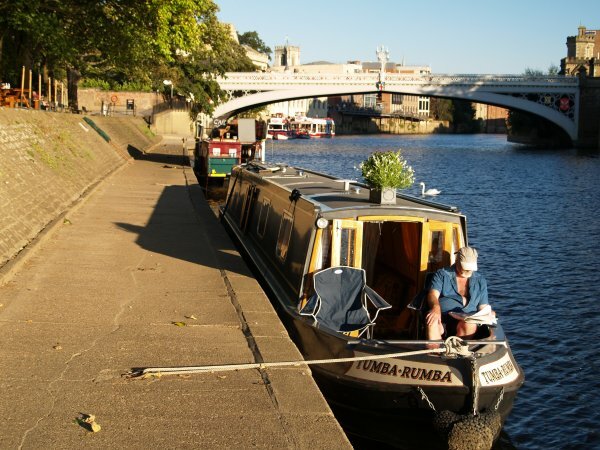 Go for a pleasant cruise-trip on the River Ouse. 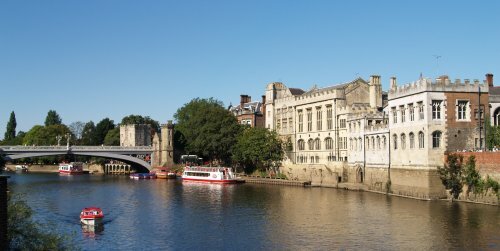 View of the Lendal Bridge (below) from the Ouse Bridge. On the right, the restored medieval Guildhall cuts a fine sight. 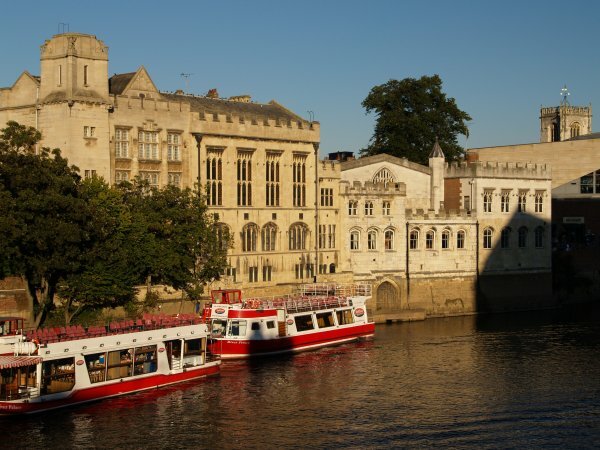 The Guildhall and the cruise boats. 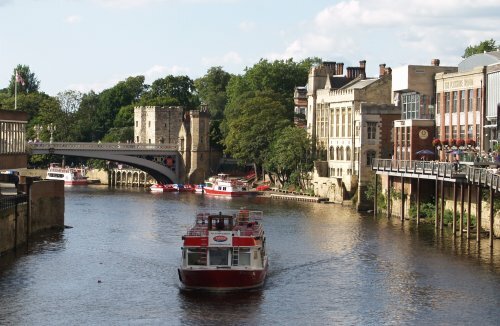 The Ouse Bridge is the middle bridge of the three main crossings of the River Ouse at York. 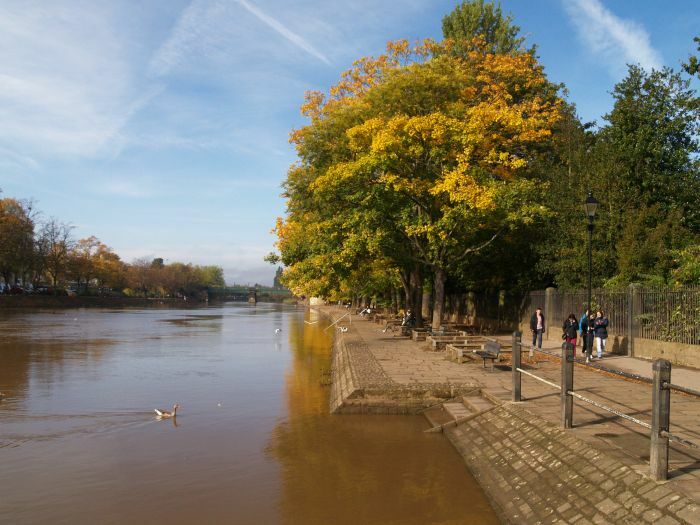 The Ouse Bridge was built in 1810-1820 by Peter Atkinson Junior and is composed of three elliptical stone arches and niches in the piers. 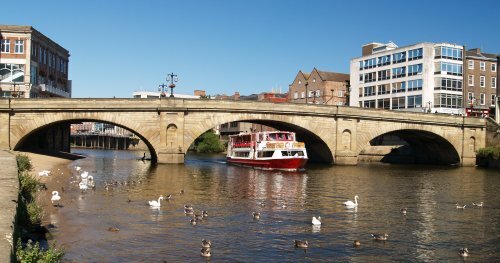 The main crossing down stream is the fine looking Skeldergate Bridge built in 1871-1878 by Thomas Page. Like the Lendal Bridge, it is built of iron with Gothic details and consists of a larger central arch span and two smaller arches either side. 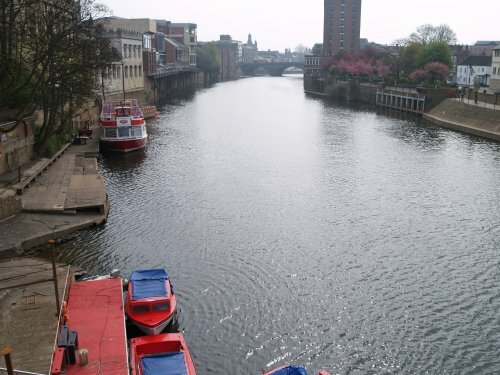 Above & below: Looking back upstream from Skeldergate Bridge to the Ouse Bridge. On the right is the Kings Staithe. 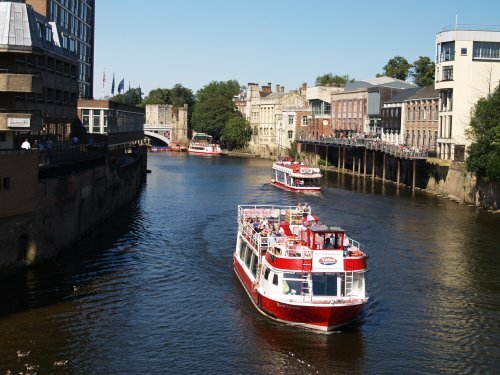 The view from Skeldergate Bridge looking towards the city centre as the River Prince returns from its tourist cruise down river. 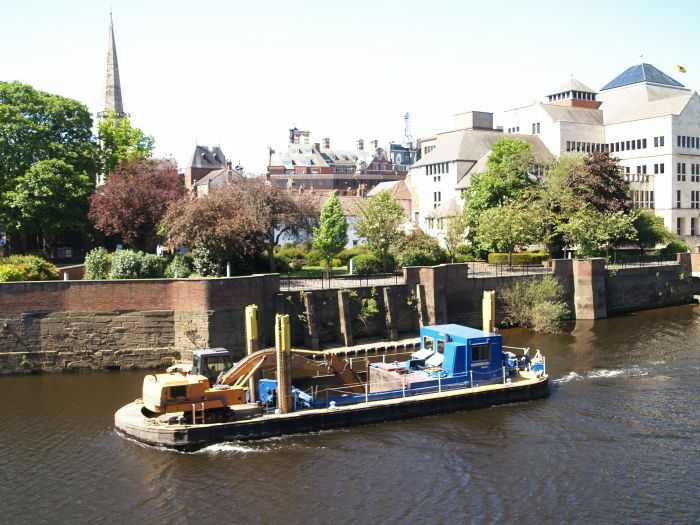 One of the dredgers that keeps the River Ouse navigable? 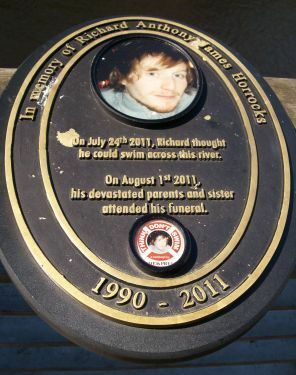 By the City Cinema is a memorial plaque to a young man. 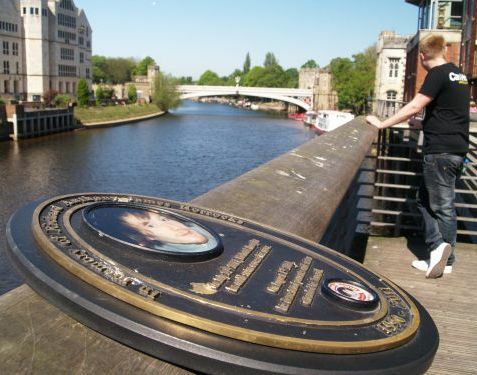 On July 24th 2011 Anthony James Horrocks tragically drowned while trying to swim across the River Ouse - PLEASE take care by the river banks and walkways, especially after a night out on the town.